A Utah couple recently discovered they were sharing their home with tens of thousands of bees. “We were just sitting on our couch, turned off the TV and could hear some buzzing in the walls,” Tyler Judd of Provo, Utah, told NBC News. So they called bee-removal specialist Albert Chubak. 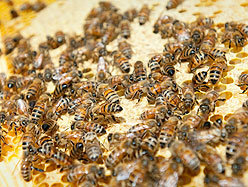 Chubak found a bee colony with between 40,000 and 60,000 bees.